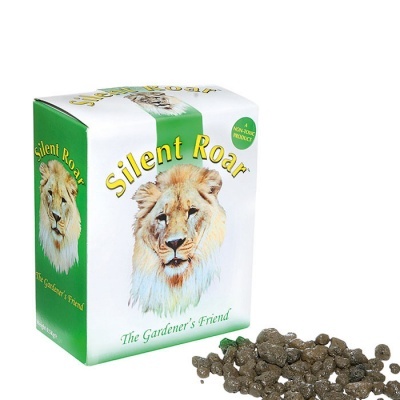 Silent Roar 500g Carton - 'The Gardener's Friend' - provides a non-toxic natural Nitrogen based fertiliser that also acts as a garden Cat deterrent due to the pellets being soaked in real essence of lion dung. Silent Roar new improved formula works on the natural basis of the territorial chain in the cat kingdom, when a domestic cat smells the scent of a larger cat (that of a Lion). Due to the natural defence system built into the cat kingdom, the domestic cat thinks twice before entering the zone that has been pelleted. Silent Roar is a nitrogen based fertiliser which also helps leaves to grow and keeps them luscious. For natural gardeners, Silent Roar is a great gardening innovation for the environment, containing no harmful chemicals in it’s formulation. One application of this fabulous deterrent will be effective up to three months. A non-toxic product containing 5% Nitrogen. Remove previous cat territorial deposits and replace with silent roar pellets in the same spot. Should cats continue to return just repeat the process until they are convinced a lion is present. Cats will not choose to compete with for a larger predators territory, so we advise to wear gloves to stop human scent being transferred to the pellets.